Home » Gardening » The One Plant that Could Change Your Life Forever. The One Plant that Could Change Your Life Forever. Growing, caring for and propagating Hibiscus moscheutos also known as “Dinner Plate” Hibiscus. When I say this plant could change your life forever, this is what I mean. If you were to start out growing and selling only this one plant from your backyard you could quickly establish yourself as the go to person for Hibiscus moscheutos ‘Lady Baltimore’ or any of the three other popular varieties. 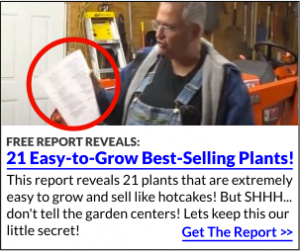 That’s all it takes, is one plant to have a nice little business growing and selling really small plants in your backyard. You can grow hundreds of these in a really small area, slip them out of the pot or shake them out bare root, put them in a box and off they go to your customer. I just ordered 400 of them for myself. My Original Backyard Nursery started with just one kind of plant and quickly grew into an enterprise that changed my our lives. These dinner plate Hibiscus are what I call “Instantly Fall in Love, Gotta have One Plants”. As soon as somebody sees them they instantly want one. And they are fairly easy to grow. I have three different kinds of these plants in my landscape and I am crazy about them. They are perennials and die back to the ground at the end of each growing season. When I first saw them I was really skeptical of how hardy they would really be. I didn’t really have any place to plant them but I bought about five of them anyway then ended up leaving them in the pots, unprotected for the winter figuring I probably killed them. I wasn’t happy about that, but my life is crazy and they just did not get planted last fall. This spring they completely amazed me when they started growing. We moved them out back where they would be watered and just last week I finally planted them in a new landscape planting that I did at the nursery. Lord Baltimore Dinner Plate Hibiscus. These plants have completely amazed me! They are loaded with extremely large, beautiful blooms and grew to a height of almost 48″ this season alone. Even though I neglected them last fall and winter. And trust me, we had some really cold weather here in Northern Ohio. These are tough cookies and they are beautiful. Now I wish I had 200 of each color to grow and sell! Blue River Dinner Plate Hibiscus. I have yet to propagate these myself but I am told they can be grown from cuttings and can also be divided in the spring. Sounds easy enough to me. By this time next year I hope to have at least 600 of these in my nursery for sale. This is one plant that will sell, and sell, and sell. You could specialize in just three colors and sell every one that you grew right from your backyard. You could easily sell these as small plants to the wholesale market and never have anybody coming to your house. Just put them in a box and off they go. I just found a grower that has small hibiscus for 90 cents each. You can bet I’ll be on the phone to him this week! My Backyard Growing System comes with a directory of wholesale suppliers. These are all of the supplies that use to buy plants and supplies for my nursery. The directory is a digital download, you can be reading it in minutes. Caring for Hibiscus moscheutos, Dinner Plate hibiscus. Hibiscus is super easy to care for. Plant them in a sunny area and keep them watered as needed. They are fast growing so they do need plenty of water. During the growing season just water and leave them unpruned. When they start blooming it’s important to dead head them (remove the spent flower blossoms). If you do that, they will reward you with more and more of those big beautiful blooms. They are perennials so come fall the frost will kill the top of the plants but the roots will be fine. Sometime after they have gone through a hard freeze where the temperatures drop below freezing for at least a few hours go ahead and cut them back to stubs or only three or four inches from the ground. If you want you can wait and do this early spring. Come spring they are a little slow to get started so be patient. But once they start growing they really take off and by the end of July, early August they start making flowers. Propagating Hibiscus moscheutos, Dinner Plate Hibiscus. There are two fairly dependable ways to propagate these plants. One is from softwood cuttings during the summer months and the other is through division. If you are going to do cuttings do them about 6 to 8 weeks after the plants start growing in the spring. In most zones that’s around mid June. There are a lot of different ways to do softwood cuttings and I show you how the many ways on this page. Hibiscus moscheutos, Dinner Plate hibiscus from cuttings. 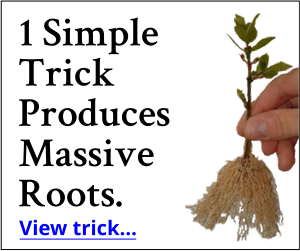 Make sure to do the cuttings early in the summer so they have a chance to establish a nice root ball. Once the cuttings are rooted I’d just leave them right where they are and come winter make sure the flat is uncovered but in a protected area. Let them freeze along with the rest of the plants. Then come spring just as they start to show signs of life you can transplant them to where you want them. When you transplant them gently remove them from the flat being careful not to damage the roots. If you want to divide them do so in the spring, just as they start to make buds. Be careful to not damage the new growth, but you are going to have either pull, cut or tear the roots apart in order to divide them. That’s why you want to do them just as they are breaking dormancy so they don’t have a lot of top growth to support right after being divided. Growing Dinner Plate Hibiscus from Seed. Will they come true from seed? I don’t honestly know, I’ve never grown them from seed, but it is fairly easy to do. If you want plan to grow from seed leave some of the seed pods on the plants after the flower is spent to allow the seeds to mature. When the paper like seed pods start to show signs of peeling, collect the seed pods and store them in a paper bag so as they open you can collect the seeds and not lose them. When I researched this I found conflicting or incomplete information because some say to start them inside in the fall. But I’m not sure when to move them outside. I’d like to think that new seedlings are not going to do well if moved outside and allowed to freeze just weeks after germination. But if you leave them inside then you’d have to care for them inside all winter long which would get them out of sync for a dormancy period etc. So here’s my two suggestions . . . Collect the seeds in the fall and store them in a paper bag in a cool, dry place over the winter. Come late winter soak the seeds for about an hour in warm water. Drain them and let them dry enough that you can separate them, then sow in a flat as you would any other seed. Sow on top of the flat, press them against the soil with light pressure so the seeds are making good contact with the soil, then sprinkle a very light layer of soil over the seeds. Keep them watered and warm but not soaking wet. Put a fan near the flat to keep air moving so you don’t get damping off or other fungal issues that often occur around moist soil indoors. Once they are about 1/2″ tall you can transplant them into grow blocks or a plug tray. I like plug trays because the roots don’t get tangled and the plugs can easily be slipped out of the tray and planted without damaging the roots. Once the calendar says the danger of frost has past you can plant out in the garden. The other option is to collect the seeds in the fall, soak them as described above, and sow them in a flat outside in a protected area. I know this sounds harsh, but nature knows what it’s doing and this is how the plants typically propagate themselves in a natural setting. We often do this with Dogwoods and Japanese Red maple trees with great results. We often get better results with Dogwood trees and Japanese maple trees doing them in fall than we do holding them until late winter. It’s True. One Plant Can Change Your Life Forever. But Only if You Take Action. I hope you found this interesting, helpful and informative. Questions or comments post them below. Read about the hibiscus. Now tell us where to buy them. There aren’t any on them on board. Found some but not pie plate. Just regular size. maybe 4″. If you have access to the members area ask this question there. They have several wholesale sources that I cannot post here. do you know anything about cactuses? Not really, my mom was the cactus expert. Do you happen to know any good info. on ginseng seed? I do not, but I do know that it’s really difficult to propagate Ginseng. If it were easy to grow commercially big growers would be doing it and not buying in harvest from the wild Ginseng. I’m in the progress with wandering Jews I don’t know if there a market for them but my wife likes them so know lost here. I think I’m going to grow some Ginseng I do have a lot of woods on the property and have time to learn more about them. Hopefully I can find a buyer in the future. I’m in the progress with wandering Jews I don’t know if there a market for them but my wife likes them so no loss here. Wandering Jew falls into the house plant category and we do get some requests in the members area, http://backyardgrowers.com/join, I don’t know a lot about that market. I am loving my hibiscus. I bought 2 plants about 20 years ago from a local greenhouse. I paid 50 cents each for them! One is pink, one is white. They are beautiful and the blossoms on them this year were 9 inches across. I have two of the wine colored hibiscus and they have completely different foliage..much more attractive in color and shape. The blossoms are smaller on those. I purchased them from the farmers’ market a few years back. The ‘regular’ hibiscus has reseeded itself so that one whole garden is full of them with just 4 or 5 plants and they have spread to the adjoining garden as well. I started some from seeds but I have to say only about 1/3 of the seeds I planted actually grew into plants. I just put them in small pots and sank the pots in the veggie garden in a row. Just this week I found two more seedlings under the larger bushes. In fact, I had pulled them out in my weeding and then realized that they were baby hibiscus so they got planted in the veggie garden as well. One thing I didn’t see mentioned anywhere is the Caddis Fly larvae. This is the first year in the last 3 or 4 that the hibiscus leaves haven’t been turned to lacy veins due to the little green worms munching away. They are very hard to spot on the underside of the leaves. I have, in the past, used a mixture of 1 part Dawn dish liquid to 3 parts water. Having tired of using a hand ‘sprayer’ bottle like hairdressers use, I bought an actual sprayer to use only for the hibiscus and, of course, now there are no worms! LOL! I am not, however, complaining. They look absolutely gorgeous this year…white, pink, cranberry. Speaking of seeds, can one grow Cannas from seed? This is the first year I have noticed seed pods on the yellow Cannas at the local library. I wonder if they would germinate and become yellow adult Cannas. Keep up the great columns and all your work to make the plant people happy! I have passed your website along to many of my friends. I really don’t know, but I’m sure you can. You’d have to google seed starting data base then look up the Cannis. I have grown canna from seed. Actually, they self seeded! I would suggest you plant in the fall since they seem to need the cold to germinate in the spring. They did not bloom the first year since they were still quite small but given time, they turned out beautiful. Does anyone know where I can buy a dinnerplate all about bling hibiscus? I bought some seeds but they were not real. The picture of the flower that showed a ruler measuring the flower to be 5 to 7 inches (don’t remember the exact width) is not a true Dinner Plate Hibiscus. I have grown the true ones and the or = to 10 inches wide and don’t get much taller than 3 feet. I love the white ones with the ruby thoart. Do you sell plants or sell cuttings? The picture of the flower that showed a ruler measuring the flower to be 5 to 7 inches (don’t remember the exact width) is not a true Dinner Plate Hibiscus. I have grown the true ones and the or 0 to 20 inches wide and don get much taller than 3 feet. I love the white ones with the ruby thoart. Mike, we are in Illinois and our Lord Baltimore went crazy this summer and is about 10 ft high and had tons of blooms!! In fact it is now October 11th and there are still blooms on it!! Last year I cut the stalks down to short nubs, but new shoots started this spring from other spots to create what I had this year. I assume that is normal and how it grows?? It seems to be creating a large ball of roots in just 2 years. The stalks this year are about 2 inches in diameter. My husband is going to need his Sawz-All to cut them down. Are we doing this right?? I think you are. They need room. They grow like crazy before flowering and get quite big. The good thing is that they die back in the winter and you can start over. Aren’t there issues with selling these without getting approval from the Flemming Brothers who originated this hardy hibiscus cultivar? That would only the be case if the plant is patented, and the patent is still in effect. To my knowledge, a plant patent only last for 20 years from dated of application, but don’t take that as legal advice, research it to be sure. Some plants have names that are registered trademarks. The trademark lasts a lot longer than the patent but only protects the name of the plant. We are Indian base online plants and seeds provider, We have thousand of hibiscus in our garden, we are new in gardening so, looking for how to grow, care and usage of hibiscus , this article is very informative we learned many things from this article. thank for share with us. If you have more than one try pruning just one, very early in the season. But chances are it’s still going to get very tall. Mine don’t fall over and I leave them unpruned. Mike. Hi I have been in Ohio for 6 years and will be moving to florida in a few weeks. Can I take some pie plates with me a grow them there? I’m not sure, it depends on the zone in Florida. These are perennials and need to completely rest for the winter. I live in North Florida. They do great here. More in part shade. I stake mine with stretchy cord and trim it all the way down every year and it grows to about 5 ft one of my favortire plants and easy. I inherited a wine-colored one thirty years ago from my grandmother; it bloomed every year except the last two when it has been struggling, probably weather-related. As someone else said, they are very slow to emerge in the Spring. Here in northern Illinois, Zone 5a, it is around Memorial Day. Just a word here, as Mike has cautioned us many times to know the variety you are propagating. A lot of the newer varieties of hibiscus I am seeing in the catalogues and at our local nursery, appear to be patented. Okay to grow, not okay to propagate. Thanks, Mike, for all your helpful information. You get high marks for Shares Well with Others. I just planted a Lady Baltimore hibiscus and was rewarded with big beautiful blooms. But they only last one day. Is this normal? I did plant it in a windy area near a sprinkler head. Is this my problem? Thank you for any info you provide me. The sprinkler for sure is probably going to wear on the blooms, then the wind. See how it does with more blooms, you can always move it later. Yes, one day. That’s it., but they usually put out a lot of blooms. It is normal I live in zone seven and my hibiscus all bloom for one day. After posting Mike Vergie is right they winter great here in NC and by the way the seeds I had were a gift to me from my mother-in-law that were given to her by her mother and ther bloom like crazy. Dear Mike , What you guys up there call Lady Baltimore Dinner Plate Hibiscus. We call them here Victorian Heirloom hibiscus. I have thousands of seeds I’m fixing to germinate if your interested or if you interested in just the seed. I was almost areested once cause a police officer came to the wrong house looking for some one else.But wrong street address and was gonna to arrest me. He says lady do you realize thats a pot plant I just laughed and he asked what was so funny about that? I asked him to look start up at the red blooms and told him thats why I was laughing. All the flowers had fallen from the bottom but not from the top. He apologized and all was good. Anyway if interested let me know. I also have some Victorian Heirloom almond bush babies I loved to sell. Let me know as well as heleborius Lavender color.I hope to here from you. GAIL… I HAVE HIBISCUS SEEDS AND YOU CAN REACH ME ON FB. I am member of the mikes backyard growers club.. I am interested in the dinner plate hibiscus seeds. with the info on the price and how to order. Just a quick note to tell you I have propagated these huge hibiscus from dry seed planted in potting soil in a planting tray covered with plastic top and have had flowers 8 ” across. Such beautiful flowers. The seeds were from my own plants. I live in NC and they weather the winter fine. So enjoy all the info you put on this site. Keep up the good work. Blessings! Transplant when the plant is dormant. Too much fertilizer can affect blooms because the plants are too busy growing to slow down and make flower buds. Once they reach a certain point all they need is time. They know what to do. But if we force feed them they can’t get slowed down enough to bloom. The holes in the leaves may be Japanese beetles they love hibiscus. Thank you so much for sharing, this is great information to have. If you have seeds I’d be interested. I’m growing a large pink hibiscus d li e in Moorhead, Mn. I was surprised it came back through our winter. Slow growing but hardy. I wrote you about plant once before and did not get an answer. I live in W.Cent.Fl.We get below freezing ( in the 20 s ) 2-4 times each winter. Will these hibiscus survive the rapid warm up ( upper 60s to mid 70s in days) following each freez? I have family in Orlando and they can grow tropical hibiscus. Central Oklahoma has wild swings in temperatures, and my “hardy hibiscus” do fine. They grow back every spring. I have a red one witch blooms every August in zone 5. The flower is every bit as large as the ones shown in this news letter. It’s never been a true red but a wine color, but beautiful nonetheless. This year I don’t know what happened but it looks like something sat in the middle of it and broke most of the stalks. Next year I will use a wire stake and let the stalks come up through the squares. I’ve never had to do that but it waits all year to bloom and I wait all year to see it! I have a picture of it but don’t know how to attach it to the news letter to show you. Unfortunately anything that needs lots of water is verboten in the southwest. Drought has finally woken up some folks who have always insisted on bright green St Augustine lawns that they water every other day. But that said, I have NO lawn (lots of mulch) and flowers 12 months of the year in San Antonio just using native and adapted plants that require almost no water even in droughts. I have a couple antique roses that grow on their own roots, bloom 12 months a year here in San Antonio, TX and today is the first day I watered either of them. I take cuttings every spring at the end of the first big flush of blooms using the new woody growth. We have a plant that has many names (Barbados Bird of Paradise, Ceselpenia (sp? ), etc.) that has loads of brilliant red and yellow blooms all summer. I start those from seed as well as a number of other plants that I collected form all over. BTW, one great place to collect cuttings and/or seeds is a deserted homestead. Anything that is going strong under those conditions is very well adapted to your area and survives without any special care. Like you I could go on and on, but I love plants. Mike check out the Lonestar Hibiscus. It too is hardy. Mike I thought some of your readers ( and you ) might like to know that I have found these selling on EBay. But hold on to your hat price wise. One seller is selling a 10 pack of Lord Baltimore seeds, just seeds mind you, for $4.99. He’s already sold 37 packs !! Gee I just can’t wait for your system to be delivered !!! I don’t believe true Lord Baltimore seeds are viable and if they do grow they may not look like the parent plant. Mike, would these survive winters in northern WI — Green Bay to be exact? We have recently be “re-zoned” as Zone 5. Our winters from late November to early March usually have below freezing temps everyday…and sometimes, esp January, below zero. Of course it depends on the severity of the winter, but I certainly would be willing to try them if I were you. I’d wait until spring to plant so they have plenty of time to get established. Mike, I enjoy your emails & videos. Believe I have 2 growing in my yard in central Mississippi. The entire flower is reddish-pink in color and larger than my out-stretched hand. They are blooming at this present time and also bloomed in June. I call them old-fashioned hibiscus because I know they are not tropical. Mine came from my mother’s yard before she passed away. They were a transplant from her sister’s home in Alabama. Every time I see their big beautiful blooms, I think of my mother and my aunt/uncle. 🙂 I would have included a picture, but I didn’t see a place to attach in the reply. Hi Mike, I just wanted to let you know that these can be propagated from seed. I collect seeds from mine in the fall and then plant them in early February just a few week before I start all my other garden stuff from seed. I have been very successful with this method. I then plant them right in the ground in the spring after frost has passed. Thanks Debbie, that information is more than helpful. Just today Amber and I were looking at the seed pods. Hibiscus ‘Lord Baltimore’ has red, ruffled flowers. It grows 5-6 ft tall and 4-5 ft wide. The flowers can reach 8-9 inches in diameter on mature plants, which have green, deeply incised foliage. This is a cultivar developed by Robert Darby and it is a named clone that cannot be grown from seed. In fact, this is a sterile clone that is unable to set seed, which makes it bloom more heavily than most other hardy hibiscus. The plants I sell of it are all grown from tissue culture. There are many different varieties. It sounds like “no seeds” applies to this one variety. I’ve never gathered seeds from my “hardy hibiscus”, and I’ve never had a “volunteer” sprout from seed. tried to separate the root last year but the piece that broke off died. Will try proprogating some soon. Do you sell these? If so, I am looking for blue or purple ones. Also, do you sell pagoda dogwoods. In Jasper county,IN, I’ve been told a license is needed to sell plants. How do you get around this problem? I’ve been frightened to do anything because I don”t want to get fined or put in jail. This happened at a friends yard sale! My pink Hibiscuses are now in full bloom and almost 8 feet tall. They get sun entire day (Detroit suburb), never watered this year and in the past 8 years, totally neglected. Mike do you think these would do OK in central Florida ? In Central Oklahoma all the stores that sell plants sell these Hardy Hibiscus. I’ve also seen them online. Check Michigan Bulb Company and Springhill Nurseries. If you order from either of those companies you will soon be getting catalogs from a half dozen other companies. Also, you could do an internet search for Hardy Hibiscus. Hi Mike, I have some red hibiscus about 10″on 4′ plants. Will try to propagate. Will the seeds germinate? Also, I have your Backyard Growing Systems. How do I get the directory of Wholesale Suppliers list? I am in California and we rarely get below freezing. Where can I get some of these beauties? I would love to be the go to person for these flowers! 🙂 I already bought the books, I’m just looking for a place to jump in and start. This looks like a good place to me! am not sure of the name of the ones i have. Also, i got two planter boxes rooted of the double pink Camelia and two planter boxes (plastic food storage) of the double red Camelias from my mother’s yard that she got over 50 years. How do i go about getting labels to tag these plants with or should I just wirte on a popsiclke stick to identify them? J. Tagging is easy if you know what the varieties are. Cut up mini blinds make great tags. Oh yes I would like to get 1 of each color. They are beautiful…. Annette, I know that Butterfly Bush (buddleia) do a great job of attracting butterflies in general. Annette, I have some Duranta erecta shrubs. The swallowtails simply can’t stay off those beautiful lavender flowers. Andrea, excellent, great information to have. Where can we buy these hibiscus? I forgot to ask in my previous e-mail if 4 hrs of sun twice a week would be sufficient or would they not bloom? It’s annoying to have to move my plants away from the kitchen door every time I leave! Four hours of sun a day would be much better. I’m not sure if 8 hours a week would be enough, I think not. I have a beautiful yellow hibiscus growing in a container indoors. The only sun I have is in front of my kitchen back door! So I don’t have to keep moving the plant EVERY time I go out, would a grow light be feasible or can they do with just approx. 4 hours of sun a day? I’d like to have a few more in my living room as a group. I have two regular Hibiscus in a south facing room with an overhang to keep the sun from heating the room in Summer. They get sun all day during the Winter ( 7-8 hours)and no sun in Summer because of the overhang, just bright light. They bloom all year long with a short break in February-March. If you have a bright yellow hibiscus it is a tropical hibiscus.There is a hardy yellow but it is a pail yellow. I live in Denver Colorado and would like to add these to my yard. Where can I buy them? Mike these look terrific. One question though, will they work in central Florida ? Thanks for the input. I’m sure they have to go completely dormant and rest for the winter to be able to perform the way they do. I’d ask around at your local full service garden centers. They do grow in the warmest parts of South Carolina. Mike I found this information on the University of Florida Extension site. According to this ( see below ) you can grow this in northern and central Florida. In north and central Florida, these plants emerge from the ground in mid to late spring and bloom from late spring through fall. With the exception of some of the herbaceous species, a hard freeze kills the above-ground growth but below-ground stems overwinter and produce new shoots the following spring. Some species require freezing (chilling hours) to release vigorous new growth making them better suited for north and central Florida than for south Florida. Hardy hibiscus prefer full sun or partial shade and any soil that is not too dry. Hardy hibiscus are especially useful in areas where the soil is too wet for other perennials. In the landscape, they are often used as colorful, flowering specimen plants, as borders or as taller components of perennial gardens. Many are well suited to semi-aquatic conditions and can be a great way to plant marshy areas that are otherwise maintenance problems. Some, such as swamp rosemallow (H. grandiflorus), are salt tolerant and are very adaptable to coastal areas. Hardy hibiscus is the perfect centerpiece plant in large mixed containers or planted alone. The bigger the container the bigger the impact it makes. Bill, I live in central Fl. and my red hibiscus is doing great,loved the pink one I had but froze and never came back,small ones with variegated leaves red small flower comes back every year. I have both the red and white and I think my red is about 2 to 3″ larger than yours. My white is about the same size. How big do the Hibiscus plants get? They reach a height of 5′ and can grow quite wide. But since they die all the way back each year this growth is not really all that progressive. I live on the gulf in Central Florida and because they don’t freeze here they are a favorite. They can grow here to a small tree size if taken care of properly. I have gotten several new plants from cuttings. I take off the bottom leaves of the cutting except the top 4-5, dip in root starter, stick in starting soil and just water when dry and leave them alone. I haven’t lost one cutting yet. They are also very forgiving of neglect and come right back with very little care.